On 15 April, 1941, some 200 tonnes of bombs were dropped on Belfast, leaving 1,000 people dead and thousands homeless. 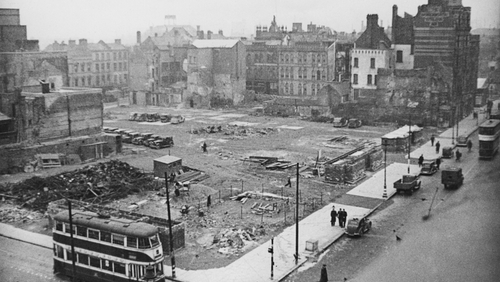 Volunteer crews travelled from Dublin, Dún Laoghaire, Drogheda and Dundalk and they found much of the city destroyed after the four-hour bombing raid. Even though Ireland remained neutral during the war, Taoiseach Éamon de Valera gave the firemen permission to help. 70 years later, De Valera's grandson Éamon Ó Cuív is calling for a memorial to those Irish firemen who dashed north to help Belfast during WWII. Speaking in RTÉ Radio One's 'Hidden Heroes' documentary, Éamon Ó Cuív said his grandfather was very conscious that he was taking a risk in allowing the firemen to cross the border. The Germans could have taken the view that it was a violation of neutrality, he explained. Mr Ó Cuív also praised the courage of the Irishmen men who volunteered and has called for a joint north-south commemoration to honour the firemen's bravery. However, the documentary reveals that there is no record of all the firemen's names and that the Dublin Fire Brigade chronicles omit any reference to their mercy mission. Scant details were recorded by the fire brigades in Dún Laoghaire, Drogheda and Dundalk, it reveals. Mr Ó Cuív said he wasn't surprised by the lack of information. The request for help after the attack by the Luftwaffe bombers was made by Stormont Minister for Public Security John McDermott. He asked Deputy Prime Minister Basil Brooke for permission to request assistance from Dublin, who agreed. The message reached de Valera possibly via the railway telegraph because telephone lines had been destroyed. The story of the Irish firemen was not officially recorded, partly because of fear of repercussions from Germany, but the documentary tells the full tale on the 70th anniversary of the event. Outside of London, the death toll from the night was the greatest loss of life in a single night air raid during the war. The main targets were the Harland & Wolff shipyard, the Short Brothers aircraft factory and James Mackie's engineering factory. With few air raid shelters in the city, the documentary tells how some people, Catholics and Protestants, took refuge in the crypt at the Redemptorist Monastery at Clonard in West Belfast. Blitz survivor Rita Brown reveals how singer Delia Murphy continued an Ulster Hall concert while Luftwaffe aircraft dropped tonnes of bombs on the city. The documentary also includes interviews with relatives of some of the firemen who went to Belfast.